A major issue in Pervasive Computing in order to design and implement context–aware applications is to correlate information provided by distributed devices to furnish a more comprehensive view of the context they habit. Such a correlation activity requires considering a spatial model of this environment, even if the kind of information processed is not only of spatial nature. 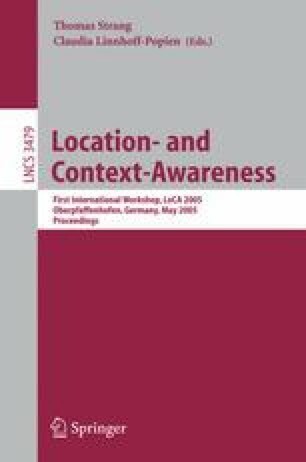 This paper focuses on the notions of place and conceptual spatial relation to present a commonsense formal model of space supporting reasoning about meaningful correlation. The model consists of a relational structure that can be viewed as the semantic specification for a hybrid logic language, whose formulas represent contextual information and whose satisfiability procedures enhance reasoning, allowing the local perspective typical of many approach to context–awareness.